When was the last time you used public transport? Living and working in the local Highett area, I don’t get to use it very often. But a little while ago, I spent the week commuting in to the city and to be honest I was shocked at what I saw. Nearly everyone was on a mobile something…phone, tablet, laptop or reading a book/magazine etc. And nearly everyone had Text Neck Posture! Being a Pilates Instructor, I’m sure that I was the only person who even noticed. But it made me realise why a vast majority of people who come to see us suffer from ongoing neck, shoulder and upper back tightness and pain. If you’ve ever experienced this type of pain, you know that it’s not fun and can potentially lead to issues further down the track that leave you with chronic pain and a diminished quality of life. Not only does Text Neck Posture have the potential to cause these issues…well, it’s just not a good look! And let’s face it, we all want to look good! As soon as your head drops, your spine loses its alignment and starts compensating, creating a bigger curve or “hump” in the upper back. So here are my Ten Tips to Avoid Text Neck, have a healthy and happy neck and upper back and avoid the “hump”. Number 1# Look Up…Create the habit of lifting your phone, rather than dropping your head. Actually the reason the head drops from the base of the neck is due to tightness in the entire spine that makes it challenging to tilt you head downwards without collapsing in the neck. Number 2# Stand, Don’t Sit…Your legs and hips are packed with power and strength (or should be! ), so why not use them. Stand with both feet planted firmly on the ground and lift your arms to look at your phone. Number 3# Do Pilates…Pilates is the only exercise method that specifically works on your deep postural muscles, including the neck. A strong spine and neck creates an upward posture and unconscious movement patterns making “text neck posture” feel awkward and uncomfortable in your body, rather than your normal neck position. Creating great posture all the time requires training your postural muscles to the point where you don’t have to think about it, it just happens. Check out Joseph Pilates himself, strengthening his neck! Number 4# Understand Gravity…Ah yes, gravity is the invisible force that drives the body to the ground and compresses the spine. We’ve all seen astronauts floating in space as if they are as light as a feather, well back on earth, gravity has the opposite effect and is with us every second of the day. To understand how much force gravity has on your body, imagine that you are surrounded by sand and every time you move, you have to move through sand…that’s hard work! So every time you drop you head to text, it’s like a big pile of sand has cascaded on to the back of your neck, creating an invisible weight that puts stress on all the structures in the neck, shoulders and upper back. So fight gravity and lift your head! Number 5# Bend and Twist…The neck and upper back love to bend and twist, it’s what they were designed to do. But the everyday activities we do most of these days, does not require any rotation or side bending. A quick test to see how mobile you are in rotation is to try backing out of your driveway without shifting your body in the seat. Can you do it? If not, then you need to read the next tip. Number 6# Stretch…Create the habit of stretching every day! Honestly, having a 10-15 minute stretching routine every day will save you a world of pain, literally! The trick is to learn how to stretch effectively so you aren’t wasting your time. Investing in learning how to stretch is investing in the future quality of your life. So start stretching for the future! Number 7# Get Abs of Steel…There is nothing that strong abs won’t help! Your abdominal muscles are amazing and designed to keep you upright and support the whole trunk and torso. When they are strong, and doing their job, your head and neck are supported in an upright position and any “slouching” posture disappears. It can be hard work getting your abdominal muscles strong, but it is worth the effort! Number 8# Become Body Aware…Do you pay attention to your body? Or do you wait until your body starts to protest at what you are doing to it and only then become aware of the state it is in. When you are “body aware”, you notice little signals from your body, letting you know it’s not happy with how you are treating it. 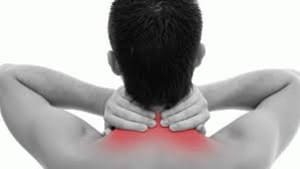 Headaches, tight neck muscles, pain in the upper back, unable to look over your shoulder are all signals that you may have “text neck posture” and need to take action to fix it. Number 9# Breathe…Take a deep breathe in and then let it all out. How does your body feel? Usually it will feel better, especially your upper back and neck. “Text Neck Posture” compresses your ribs and lungs, closing off your ability to breathe effectively and oxygenate the body and brain. So if you have been “on” your mobile device for a while, stop and take a couple of deep breathes in and out, it will stretch your ribs, upper back and neck and it will also release tension from tight shoulder and neck muscles. If you are struggling with chronic neck and posture issues, the dedicated Pilates Plus team are here to help you. Book a FREE Postural Assessment today and receive expert advice on your posture, core strength and flexibility.